A polyline based on four points. The green handle marks the starting point. The disk and the arrowhead are defined using cap attributes. A rounded corner attribute has been specified on the second point. A Bezier curve using different points: smooth point, cusp point and symmetric point. Right-click to add or remove points to an existing path. A fragment of the curve can be converted to a line, or a line back to a curve. A text line following an arbitrary curved path. The text itself can use several different typographic attributes, for instance various fonts and sizes. Three objects (rectangle, polygon and regular polygon) sharing the same attributes, a fantasy corner and a blue gradient fill. Pick attributes from an existing object with the pipette tool. Use styles to organize attributes in order to ensure coherence in a document. Every attribute can be independent or defined as part of a style. The styles can be cascaded: a child style can inherit its parent style attributes. Space evenly all selected objects using alignment operations. Numerous other operations can be used to align objects in various ways. 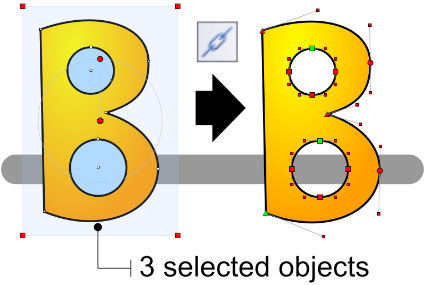 Modify the shape of an object using Boolean operations. In this example, the background minus foreground operation is used to cut out a circular chunk of the rectangle. Other Boolean operations can be used to produce unions, intersections and exclusions. Associate objects into groups avoids unwanted modifications (the group has to be entered explicitly in order to be edited). Groups can be embedded into other groups, without limit. In this example, entering the eyes will gray out the rest, showing what can and cannot be edited. Combine curves together to produce a Bezier curve with holes. Convert a regular polygon into curves to modify its shape. 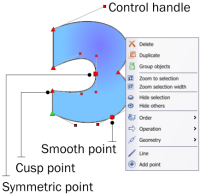 Convert text into curves to modify the shape, color and outline of individual characters. The text is no longer editable.